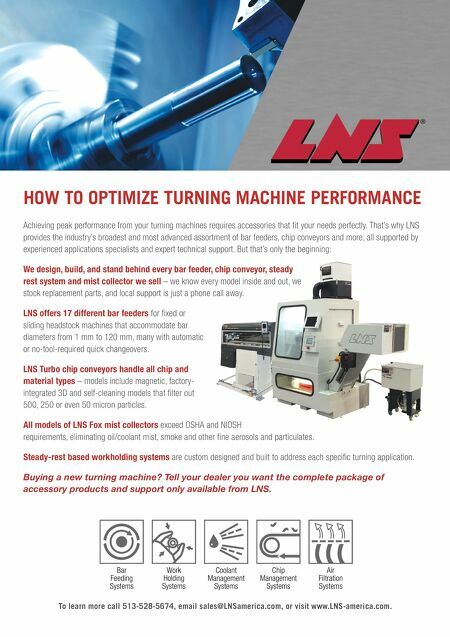 To learn more call 513-528-5674, email sales@LNSamerica.com, or visit www.LNS-america.com. 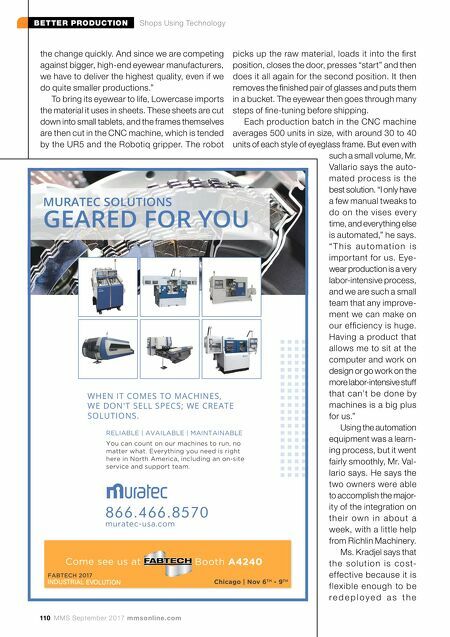 Bar Feeding Systems Work Holding Systems Coolant Management Systems Chip Management Systems Air Filtration Systems HOW TO OPTIMIZE TURNING MACHINE PERFORMANCE Achieving peak performance from your turning machines requires accessories that fit your needs perfectly. That's why LNS provides the industry's broadest and most advanced assortment of bar feeders, chip conveyors and more, all supported by experienced applications specialists and expert technical support. But that's only the beginning: We design, build, and stand behind every bar feeder, chip conveyor, steady rest system and mist collector we sell – we know every model inside and out, we stock replacement parts, and local support is just a phone call away. LNS offers 17 different bar feeders for fixed or sliding headstock machines that accommodate bar diameters from 1 mm to 120 mm, many with automatic or no-tool-required quick changeovers. LNS Turbo chip conveyors handle all chip and material types – models include magnetic, factory- integrated 3D and self-cleaning models that filter out 500, 250 or even 50 micron particles. All models of LNS Fox mist collectors exceed OSHA and NIOSH requirements, eliminating oil/coolant mist, smoke and other fine aerosols and particulates. Steady-rest based workholding systems are custom designed and built to address each specific turning application. Buying a new turning machine? Tell your dealer you want the complete package of accessory products and support only available from LNS.